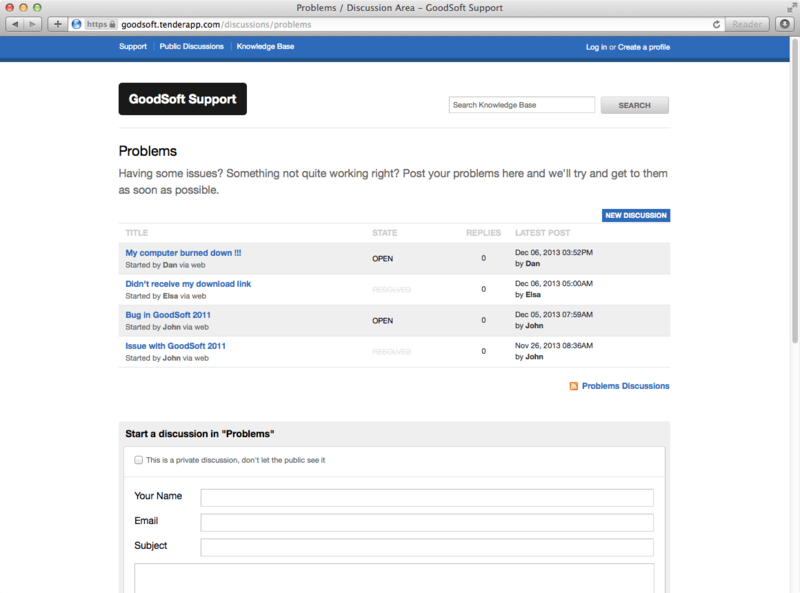 Better, Simpler, Customer Support Software. Support your customers in the open! With public forums, you can offer a public space to your users to discuss common issues and get feedback, while still keeping certain categories private (billing, orders, etc). Power users can subscribe to categories and new discussions, and help out other customers. Stay connected to your customers while you're out. Tender integrates seamlessly with email. You will receive notifications of all new messages, replies and can update discussions on the go by replying normally to emails. It's the workflow you are already used to, upgraded! You hear the same questions a lot. Sometimes a whole lot. We've got Echo Templates to help you repeat yourself. 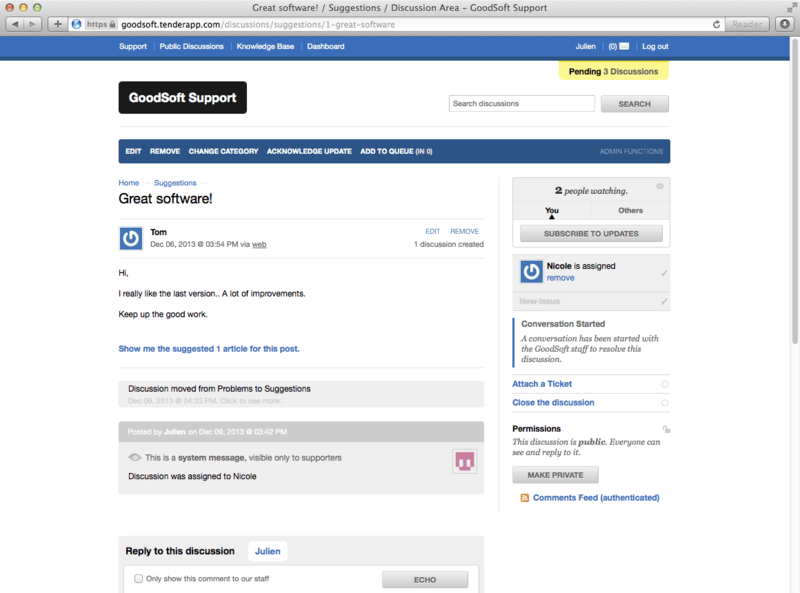 Create frequently re-used answers from scratch, or use one of your existing support masterpieces. 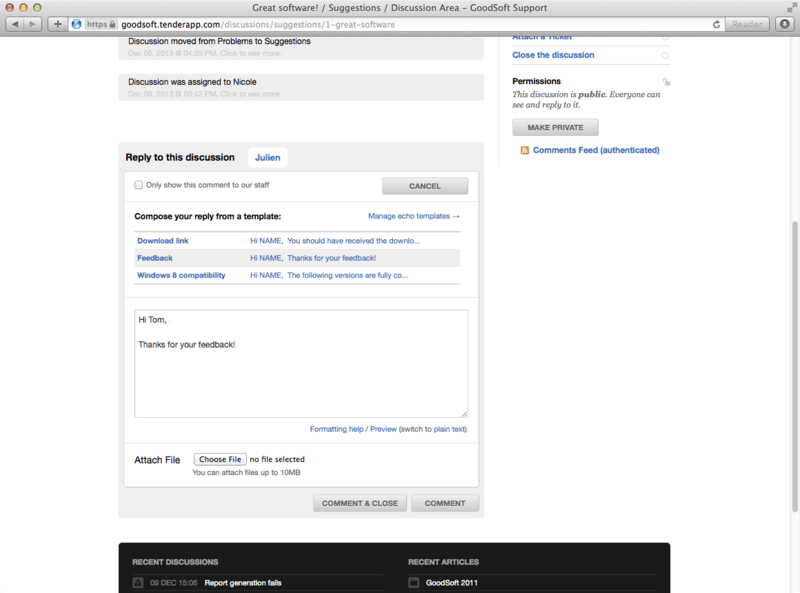 Echo Templates will save you tons of time while still letting you give each response a personal touch. 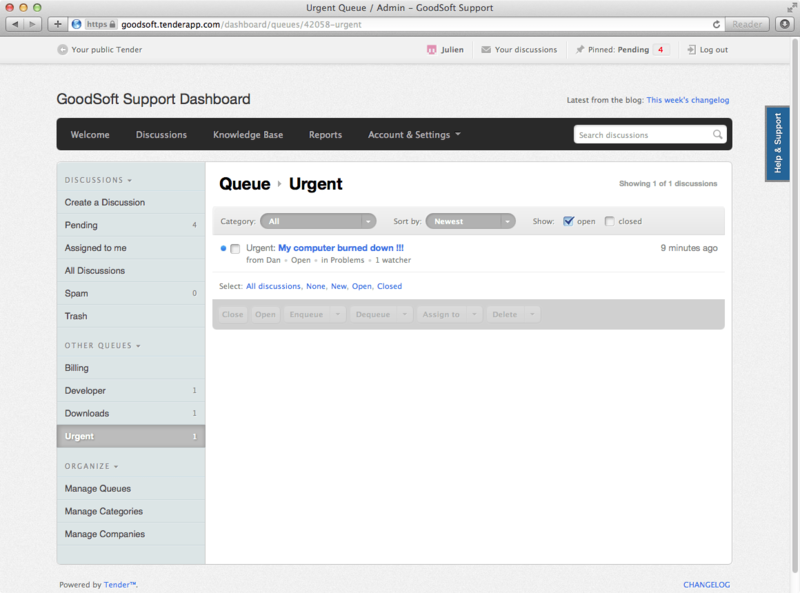 Keep your discussions organized with Queues: create and assign queues by type (Billing), priority (Urgent), person (Alex), or team (Sales). 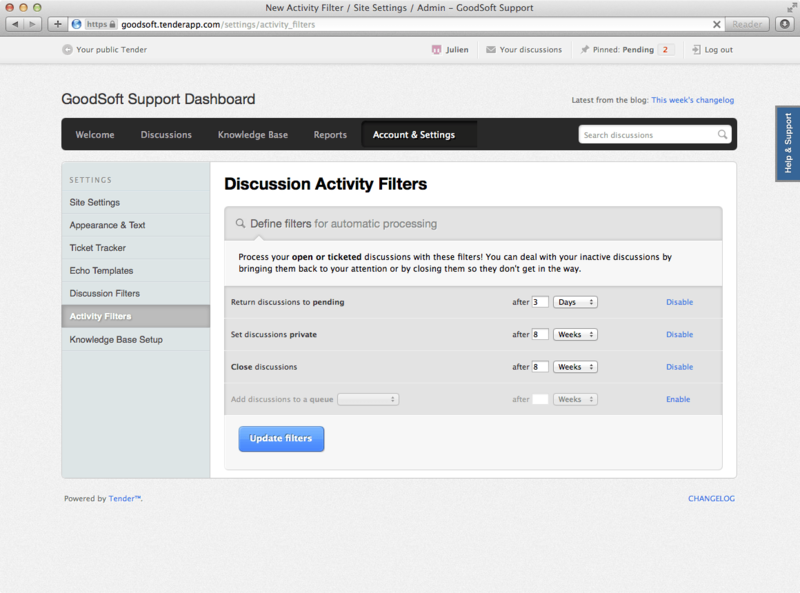 Using filters, allow team members to be focused only on discussions that are relevant to their expertise. Assignment works a bit like queueing: you can assign any discussion to a specific team member in addition to having that discussion in one ore more queues. Assignment is not visible to end-users, only your support staff, and we'll even email your team members to let them know you've got them on the hook! Tender can remind you when a discussion hasn't received a reply in a month, a week, a day, or an hour. Close stale discussions and stay on track of todos you promised to someone. Activity Filters are there to save the day! All customers are important, but some are especially important to you. You can set up special limited access to articles, discussions, and even make sure that your most important users get priority attention in your inbox. Track and view incoming discussions by week, month or year. 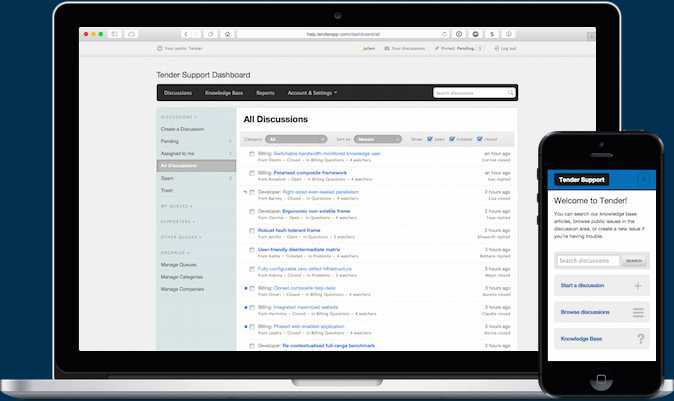 View the data for every discussion including response time, responder name, and resolution time. Reports can help you figure out when additional team members may be needed, or show when specific incidents may have brought in a large number of requests. You can provide a seamless experience to your customers. 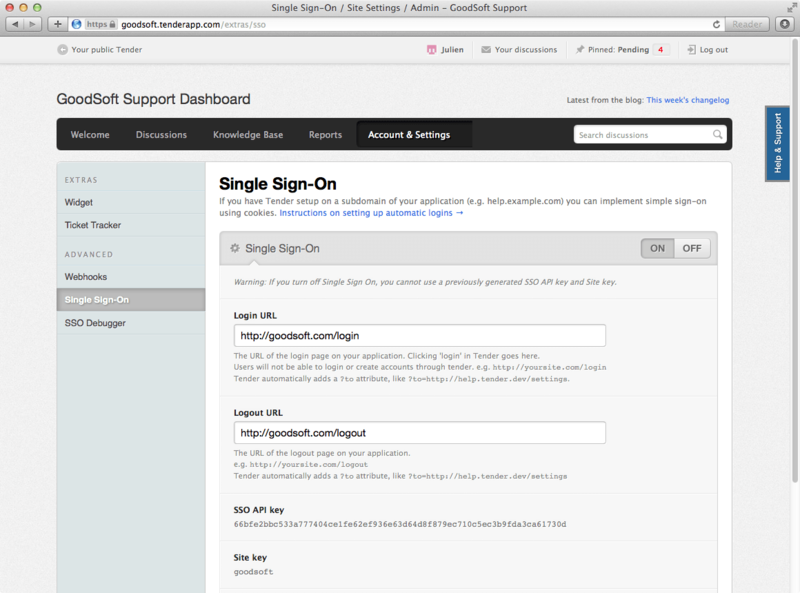 When they log into your site they will be automatically logged into your support site as well. We can even integrate with your internal systems and bring important data about the user into the discussion. You can make virtually any information your system has visible to your support team! If you're in need of simple issue tracking, check out our sister product — Lighthouse. If you'd like to ask us a quick question or keep up to date with what we're doing, follow @tenderapp. 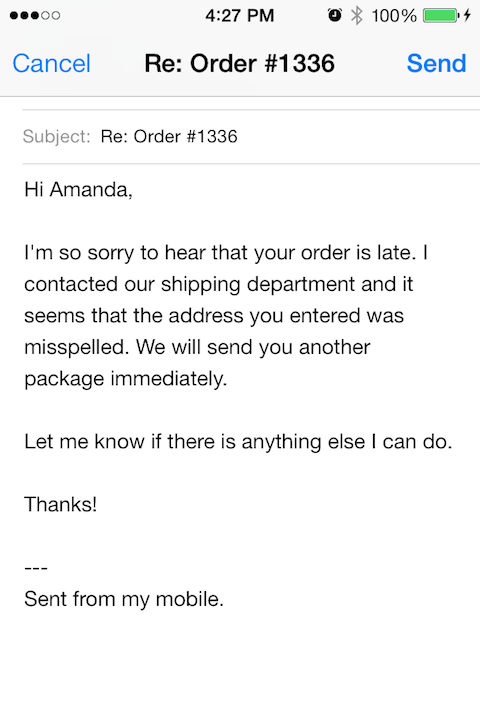 to deliver great customer support. Receive notifications, reply on the go and use keywords to quickly take action! 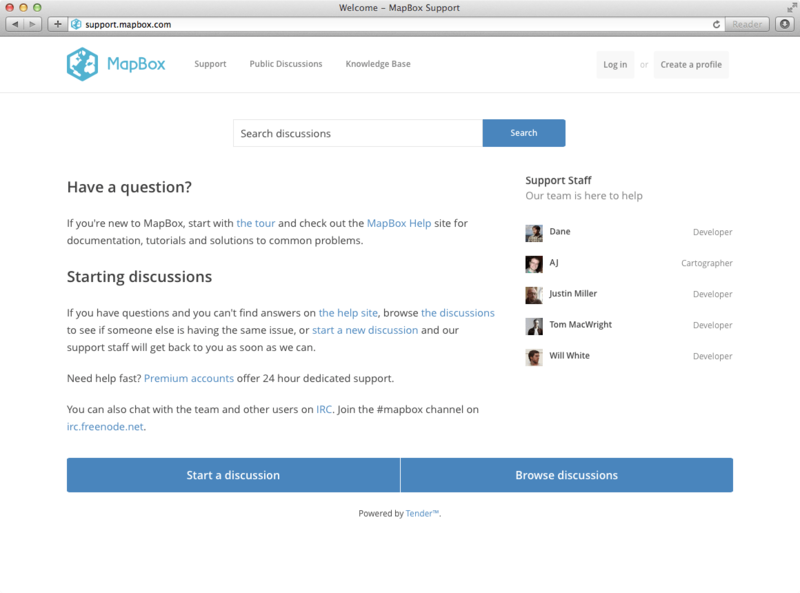 Allow your users to interact, share and discuss ideas. Reply in public, or in private. Help customers help themselves: quickly answer frequently asked questions. Let the right person reply to the right discussion with queues and assignments. Tender automatically reminds you to follow up at the right time so you don't have to. 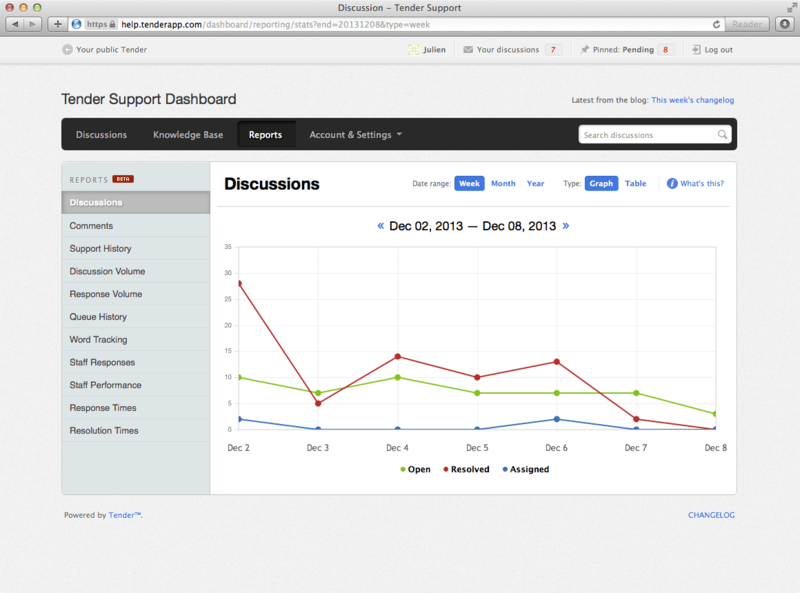 Reports allow you to keep an eye on your response times, your productivity and your team.